The Point Pleasant Soccer Club goal is to create a soccer program whereby your child ultimately has the most rewarding, fun, and enjoyable experience possible. 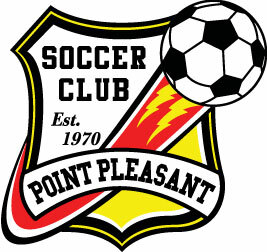 We want Point Pleasant Soccer Club to represent the ultimate soccer development program in the area. To achieve that end, we have the New York Red Bulls professional trainers at our disposal to teach the basic fundamentals of the game, sportsmanship, teamwork, and self confidence. And, those are not the only objectives or our club. For those who are interested in volunteering for assistant coach or coach position, we provide a coaching program for you to contribute to our youth’s soccer development. It is a program whereby you will learn incrementally the best way to educate and teach our youth the skills and fundamentals of the game. Whether your child chooses to play recreation soccer, or Travel Soccer, the Point Pleasant Soccer Club is committed to provide each and every child the ability to enjoy and play the game. Celebrating our 40th anniversary, we are a non-profit Organization geared to promote the greater interest and participation in the game of soccer. We offer recreational, travel, and TOPSoccer as separate programs. Children of all townships are welcome! The Point Pleasant Soccer Club encourages the spirit of fair play and sportsmanship. We help organize and control teams at various age levels. We strive to help increase the skills and attitude concerning the sport of soccer. Our experienced coaching staff has obtained the necessary credentials and licensing as required by New Jersey Youth Soccer. Here you can register for our many programs. This link connects you to our Online Registration page. This year we have opted to handle all sign ups and registrations online. If you have any questions, please send our secretary an email, and we will be happy to answer any questions you may have.